In collaboration with JOI Design, JSJ Design has announced the opening of Frankfurt Messe, Whitbread’s first Premier Inn hotel in Germany. Adopting European-style open-plan lounge, dining and reception areas, the new hotel remains true to its heritage and carries a distinct British charm. 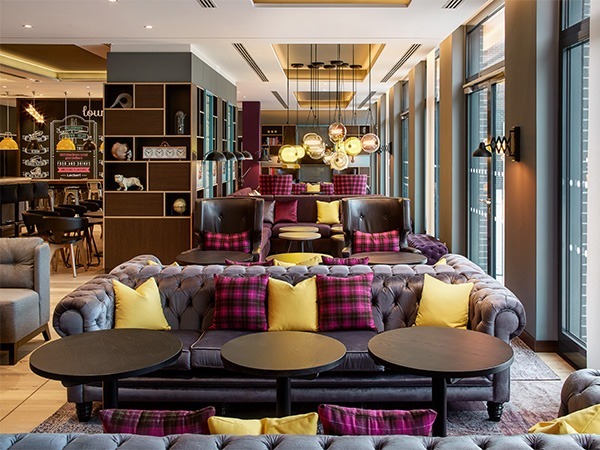 Designing many of Premier Inn’s latest UK hotel interiors, including the chain’s flagship hotel in Kings Cross and others, JSJ has formed a deep understanding of the brand. JSJ Design collaborated with Hamburg-based designers JOI Design to ensure the English brand catered to its new European cliental. In addition to the open-plan communal areas, points of differentiation can be found in the bedrooms and bathrooms, where showers replace baths and an imaginative new room layout was developed to meet local hotel expectations. The hotel utilises British motifs including the British Bulldog and the Chesterfield sofa in retaining its native image. Meanwhile, a natural-colour palette of light and dark wood and warm tones are offset by bright shades of turquoise, sunny yellow accents and pink and purple highlights. The statement pendant lighting works to differentiate spaces, from focused and bright in the Work Zone, to warm and cosy in the lounge and dining areas.